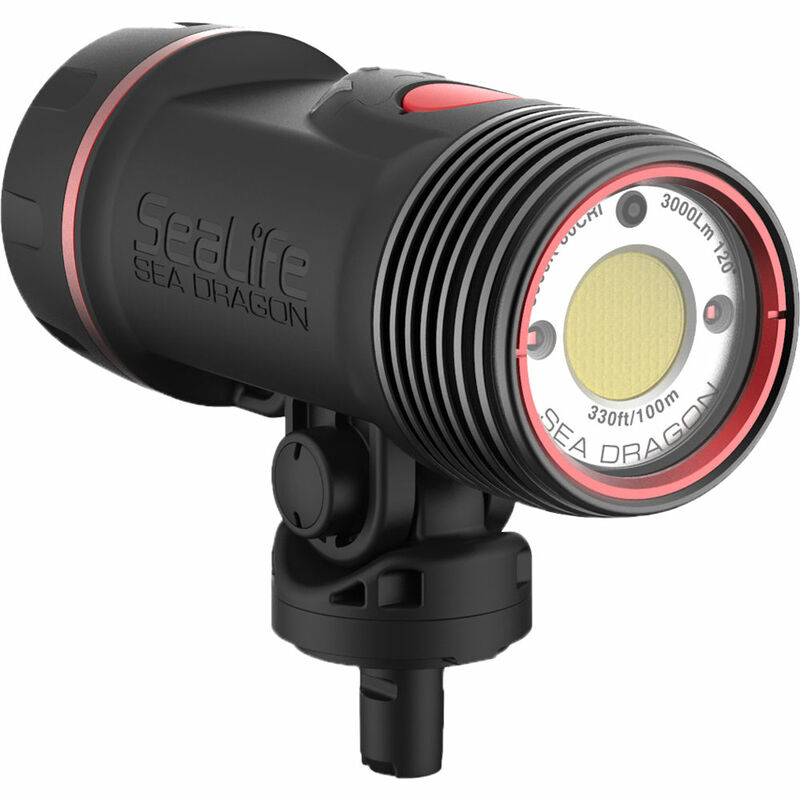 With its auto brightness technology, the Sea Dragon 3000F Auto Photo-Video Dive Light from SeaLife saves you the trouble of choosing the right output level, so you can concentrate on your subject. Aim the light at a close-up object and the output will dim to 300 lumens; aim at far away objects, and the light provides up to 3000 lumens. Along with Auto Bright, the Sea Dragon 3000F features flash-detect, which shuts off the light for one second when a strobe fires. You can also control the white-light output manually, with settings for 3000, 1500 and 750 lumens. There's also a 180-lumen red light setting that will protect your night acclimated vision and won't frighten away nighttime sea creatures. Run time on a fully charged battery ranges from 60-240 minutes. The light offers a 120° on land/90° in water white-light beam angle and an 88-66° angle for the red light. The COB LED delivers a color temperature of 5000k and a color rendering index (CRI) of 80, mimicking daylight for optimal underwater illumination. Built for durability, the light features a fiber-reinforced polycarbonate body and an anodized aluminum light head, both of which are resistant to corrosion. A push-button switching system makes it easy to turn the power on or off and cycle through output modes. The included Flex-Connect Grip gives you a mounting point for the light and can be connected to the supplied Flex-Connect Tray. There is also an adapter for GoPro action cameras bundled with this kit. Box Dimensions (LxWxH) 10.7 x 10.5 x 3.9"